View More In Mobile Broadband. 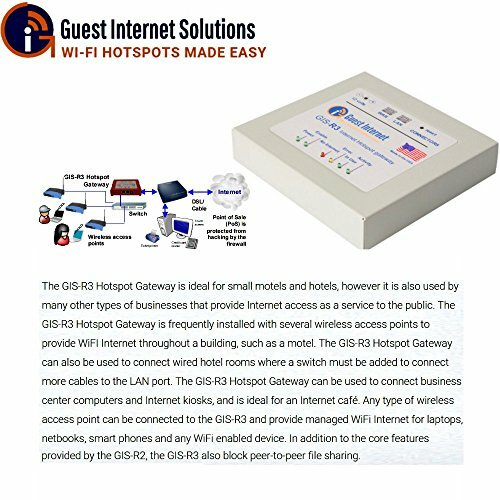 The hostpot gateway allows you to turn a WiFi access point into a commercial Hotspot. Guests can be billed through the sale of login vouchers, gain free access (by agreeing to a disclaimer) or enter their name and email address. Cost of ownership: There are no setup costs, monthly fees or transaction fees, all you pay is the purchase price of the gateway. Performance: 100 concurrent users (with no limits), throughput of 20Mb/s. Authentication: Log in using a voucher, agreeing to a disclaimer (terms and conditions) or providing a name and email address. Custom login page: Customized with an image or company logo. A login page can be designed to look like the business web page. Payments with PayPal: Guests can pay through their browser using PayPal or any debit or credit card. Firewall: Protects the business network from guests as well as from Denial of Service (DoS) attacks. Allows remote management. Content filter: Access to web sites can be filtered and blocked using OpenDNS. P2P and file sharing: Peer to peer applications can be blocked. Speed control: Each guest can be throttled to an upload and download speed. Login management: Up to 10,000 codes can be set up and reused. Reporting: 28 days of logins can be viewed, graphed and downloaded into Excel (CSV). Setup wizard: Allows quick and easy set up including a login page. Works with any type of WiFi access point (not included). Ticket printer available (not included). Control access to the Internet for up to 100 users. Collect names and email addresses or bill credit cards for access. Use your logo, background or custom web design for the login page. Works with any WiFi access point (not included). If you have any questions about this product by Guest Internet, contact us by completing and submitting the form below. If you are looking for a specif part number, please include it with your message.